A young man arrested by police in the German city of Darmstadt was found to be carrying a python in his trousers. The 19-year-old was detained for drunken behaviour after a reported altercation with another man had led to complaints from local residents. While searching him, officers noticed a "significant bulge in his trousers", a police statement said. The man told the officers he had a snake in his pants, revealing a 35cm (about 14in) baby king python. 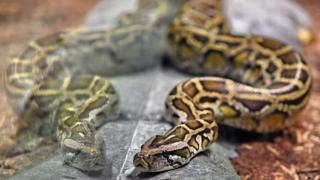 The police statement said it was unclear why the man was carrying the snake there, adding that the reptile might belong to one of the man's relatives. It added that officers were examining whether any animal protection laws had been broken.